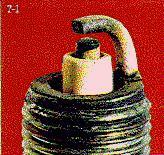 An examination of used spark plugs can reflect the accuracy of heat range application. Close scrutiny of the firing end can also suggest a variety of possible engine conditions and point the way to achieving improved spark plug and engine performance. The quantity, color or overall appearance, as well as the chemical make-up of the deposits, are all important in making the correct diagnosis. Remember that the electrical properties of deposits at operating temperatures in the engine may be entirely different than the properties at normal ambient temperatures. Deposits normally occur in distinct bands on the insulator. These reflect the different temperatures which occur between the hot insulator tip and the relatively cool insulator base. Generally speaking, tip deposits near the electrodes are the ones that control spark plug operation. If they become conductive, their "shunt resistance" is said to drop...and the plug short circuits. Illustrations in this section include common spark plug appearances as well as those encountered only rarely. If LP Gas or natural gas has been used, the color will be almost brown. 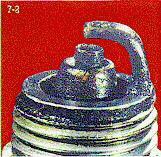 A spark plug shorted by excessive oil entering the combustion chamber is shown below. This is often caused by piston rings or cylinder walls that are badly worn. Oil may also be pulled into the chamber because of excessive clearance in the valve stem guides, or badly worn valve stem seals. If the PCV valve is plugged or inoperative, it can cause a buildup of crankcase pressure. This condition can force oil and oil vapors past the rings and valve guides into the combustion chamber. Basically, soft, sooty carbon deposits, as shown below, have a dry, black appearance. If only one or two plugs in a set are fouled, it is a good practice to check for sticking valves, a cracked distributor cap, or bad secondary ignition wires. Fouling of the entire set might result from an incorrect heat range spark plug or an over-rich air/fuel mixture caused by a clogged air cleaner filter element, a sticking heat riser valve, or a faulty choke. Fuel injectors that malfunction can also lead to this condition. Other causes include weak ignition system voltage or an inoperative pre-heating system (carburetor intake air) or poor cylinder compression. 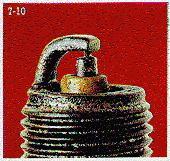 This spark plug shown below has served its useful life and should be replaced. Voltage required to fire the plug has approximately doubled and will continue to increase the longer the engine operates. Even higher voltage requirements (as much as 100%) above normal may occur when the engine is accelerated quickly. Poor engine performance and a loss of fuel economy are traits of worn spark plugs. This condition may cause misfiring at high engine RPM. Shiny deposits usually suggest that temperatures have suddenly increased during hard acceleration. As a result, normal metallic deposits do not have a chance to slough off the plug and they melt and form a conductive coating which causes the misfire. Yellow or tan deposits, as shown below, usually indicate the use of leaded fuel. 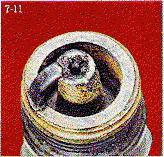 Mechanical damage to the firing end, as shown below, is caused by some foreign object in the combustion chamber. Since small objects can travel from one cylinder to another (because of valve overlap), the other cylinders should always be checked to prevent reoccurance of damage. When working on an engine, it is advisable to keep the carburetor throat (or throttle body openings on central type fuel injected engines) covered. That precaution also applies to spark plug holes. An example of overheating is shown below. Note the dead white or gray insulator nose which appears "blistered." Electrode gap wear rate will be considerably in excess of that normally expected. This is often caused by overadvanced ignition timing, poor engine cooling system efficiency (scale, stoppages, low level), a very lean A/F mixture, a leaking intake manifold, or the use of a spark plug too hot for the application. Splashed fouling, as shown below, may sometimes occur after a long-delayed tune-up. Here, deposits accumulated after long periods of misfiring or low power operation may be suddenly loosened when normal combustion temperatures are restored after a set of new plugs has been installed. During a high-speed run, these materials shedding off the piston are thrown against the hot insulator surfaces. As shown below, a buildup of combustion deposits stems primarily from the burning of oil and/or fuel addatives during normal combustion. These are normally nonconductive. However, when heavier deposits are allowed to accumulate over long mileage periods, they can "mask" the spark, resulting in a plug misfire condition. An example of gap bridging is shown below. It rarely occurs in automotive engines. Gap bridging is caused by conditions similar to those that produce splash fouling. 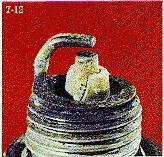 Combustion deposits thrown loose may lodge between the electrodes, causing a dead short and misfire. Fluffy materials that accumulate on the side electrode may melt to bridge the gap when the engine is suddenly put under a heavy load. As shown below, this condition produces melting of the center electrode, and somewhat later, the ground electrode and insulator. Usually one or a combination of several engine operating conditions are the prime causes of preignition. It may originate from glowing combustion chamber deposits, hot spots in the combustion chamber due to poor control of engine heat, cross-firing (electrical induction between spark plug wires), or the plug heat range is too high for the engine or its operating conditions. 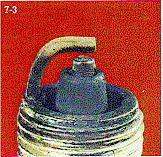 As shown below, this form of abnormal combustion has fractured the insulator nose of the spark plug. Explosions that occur when the operating condition exists apply extreme pressure on internal engine components. Major causes include a faulty EGR valve, lean air/fuel mixtures, ignition timing advanced too far, and insufficient octane rating of the gasoline.